Day breaks, the light piercing the thin cotton veil in front of the library window of the old Meeting House. The smell of slightly charred toast fills the air, expertly mingled with the scent of too-much-Lynx. Quiet whispered jokes and chides quickly turn full volume before 8 AM, jarring the dozing out of whatever simulacrum of sleep they attempted to steal while splayed across a tiny couch like a crash test dummy. It’s London Link residential weekend. Collecting the lion’s share of the young people at a Pizza Express near Waterloo on Friday evening, three volunteers (this author included) corralled the parade onto the train after a hearty meal, bound for Salisbury. Arriving at the meeting house well after dark, and having eaten already, we began to introduce ourselves to one another through a series of games led by volunteers. With everyone firm friends, the allocation of sleeping space became the next priority, and some enterprising young people elected to try and cobble the meeting houses various couches and armchairs into a bed. Impromptu blankets were fashioned from yoga mats, aprons, and everything in between. We all participated in that evening’s epilogue, which was set in the beautiful small garden behind the Salisbury meeting house, with enough benches for all. The morning saw a full vegetarian cooked breakfast, much to the delight of young person and volunteer alike. We formed small groups and set off for the delightful market in the centre of town. Volunteers could be seen wandering through the artisanal cheese stalls and local bakery tables of the quaint market; Tiger and Tesco captured the imagination of the young people more thoroughly. 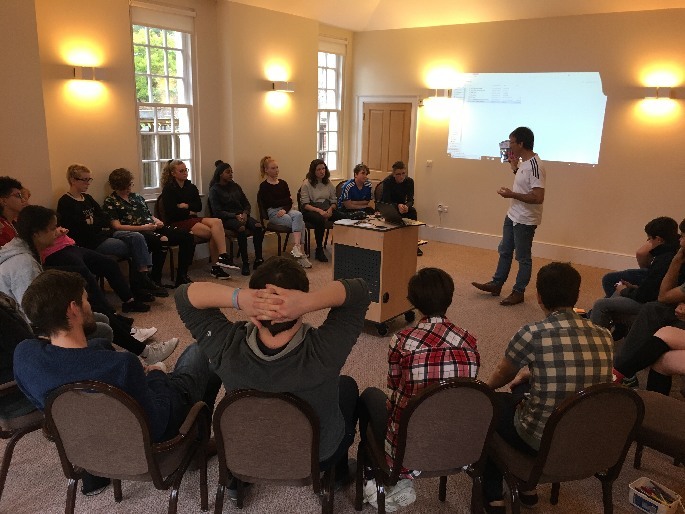 The whole group rendezvoused at the Meeting House and enjoyed an enlightening talk by Chris Mould, who worked for many years with the Trussell Trust. He shared stories about his work in food banks and with young people, and helped start conversations with such large questions as “What do you want to do with your life?” Afterwards we shared a large lunch of vegetarian Bolognese, gathering our strength for the excursion to come. Venturing out of the meeting house after our pasta lunch, we journeyed the 10 minutes to Salisbury cathedral. By this time, the weather had turned sour, and many lamented their lack of waterproof jackets and shoes. The meeting house generously provided umbrellas, which the lamenting gladly accepted. Upon arriving at the cathedral, we formed two groups and were duly shown the intricate features of this historic building by the volunteer tour guides there. Some young people expressed some fear at the notion of ascending 68 meters up medieval and Victorian staircases and wooden beams, but all made it to the top to take in the marvellous (if wet) view. By this time, everyone was damp, and a bit tired, and so the general call for tea and biscuits was well received. We walked a short distance across the cathedral grounds to find a very warm reception at South Canonry, the home of the parents of two of our volunteers! 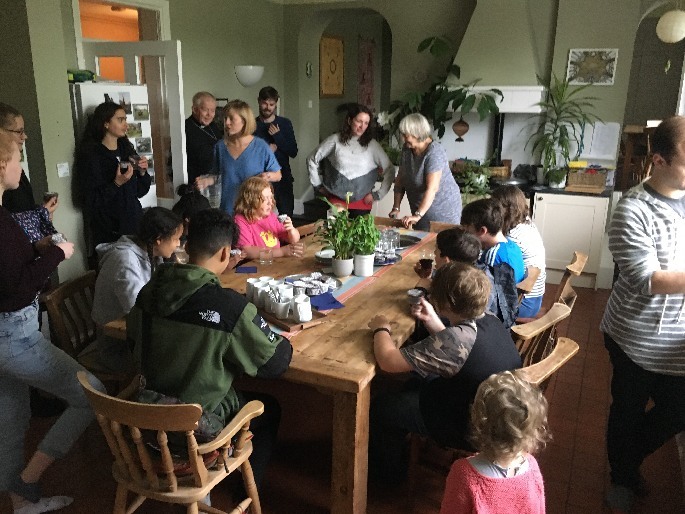 Helen, with expert assistance from her young grandchildren, had whipped up enough chocolate muffins and tea to slake the thirst and quell the rumbling stomachs of 18 teenagers – no mean feat. The young people enjoyed playing classic games like pick-up sticks and ring-toss in the drawing room, since the weather precluded any fun in the garden. 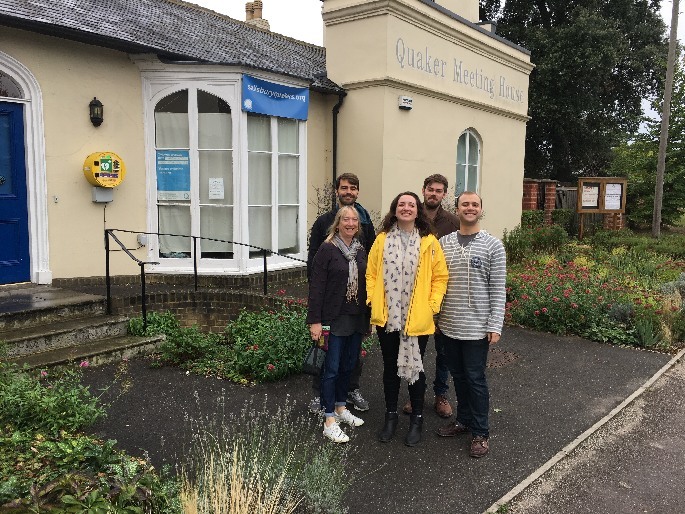 Once we’d warmed ourselves on the soft sofas, and the muffins injected us with much-needed energy, we gave a large thank you and a fond farewell to the Holtams and departed South Canonry for the meeting house. Soggy once more upon arrival, we spent the rest of the evening enjoying a dinner of potatoes and aubergine chilli, and various games and free time. The following morning, a continental breakfast of toast and cereal replaced the full cooked breakfast, and the entire group set to work cleaning the meeting house and getting it ready for the arrival of Salisbury Friends. Many a parent would doubtless shed a tear of joy at the sight of a dozen teenagers hoovering, scrubbing, and tidying. Once we finished cleaning the meeting house, Friends began to arrive. 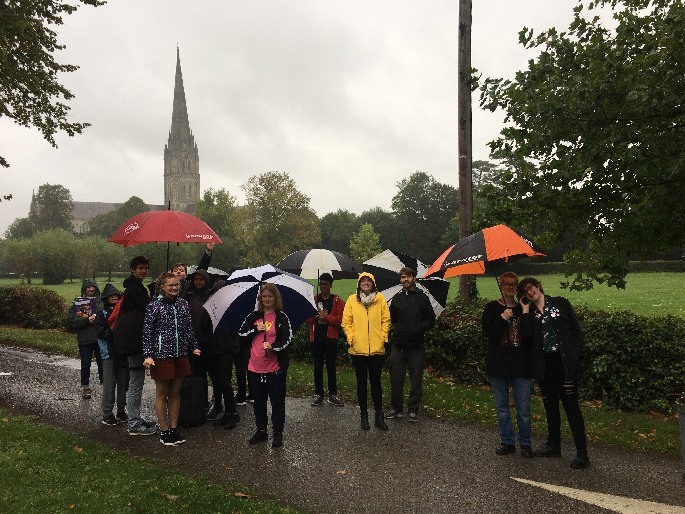 The group was given the option of staying for the full Meeting for Worship, or embarking out into the downpour on a walk around the town. Those that braved the rain joined the meeting towards the end, along with the few children who attended the children’s meeting. Each young person and volunteer added their name to the visitor’s book, which dates from 1938, and after notices, we shared a delicious curry lunch kindly given to the meeting by a local chef de cuisine. After our Friends had left we found ourselves with a few hours remaining before we had to catch the train, and played a variety of games in the main meeting room. From there to Salisbury station and beyond, as we said goodbye to another residential weekend. It was this author’s first experience of London Link, and of the residential programme. I was delighted to find a rich community of young Quakers, with clear history and deep friendship amongst its members. Despite this bond that had been forged over many such events, I was readily welcomed into the fold and embraced with genuine kindness. I am deeply grateful for the experience and for the efforts of my fellow volunteers, as well as the help and fun created and shared by all members of the London Link Group. 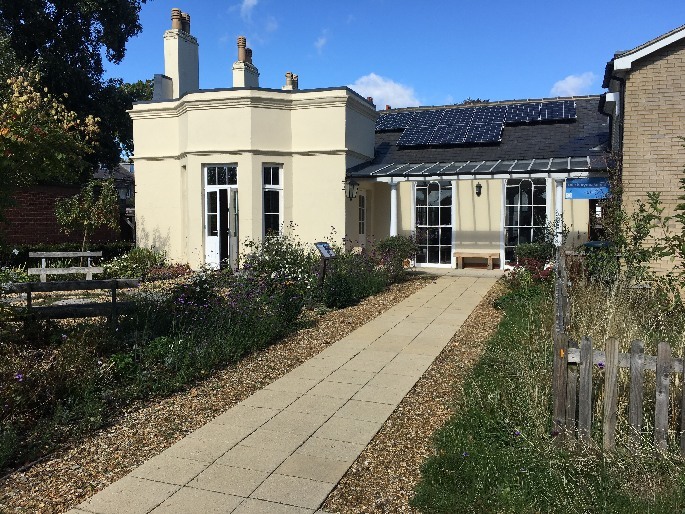 Naturally, we would also like to extend our warmest thanks to Nick & Helen Holtam for opening their home to us, as well as Salisbury Friends for trusting us with use of their beautiful meeting house. We hope to see them all again soon. A great report giving me a flavour of your weekend. Thank you!